Welcome back, Katie! 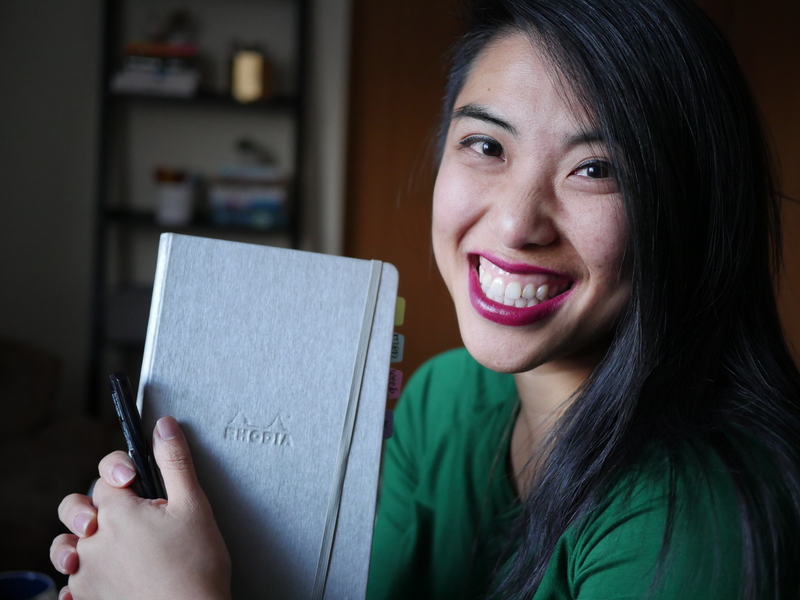 Last time, she told us about why she stopped making her bullet journal pretty, and is joining us again to share how she’s planning for the upcoming holiday gift season in her bullet journal!! Note: This post may contain affiliate links, which means if you happen to purchase something, I will make a small commission at no extra cost to you – which helps me support guest posts like this one and giveaways, etc! The holidays can be a very polarizing time of year in that they often seem to starkly separate the hyper-organized minority among us from the, well, less than hyper-organized. Holiday shopping, in particular, can require a Herculean amount of pre-planning and schedule coordination, much of which is often done in secret. Enter my lifeline, otherwise known as the bullet journal! I’ve been bullet journaling since September 2016, and last Christmas, I developed a method of planning my holiday shopping that I now swear by and will be using again for 2017. This method works really well for me because I’m buying gifts for a large amount of people (my family, my partner’s family, and various friends), and I like to brainstorm ahead of time for what I think each person might like. Importantly, I often change my mind after brainstorming through several present ideas, so I wanted the flexibility to include both my potential present ideas as well as the presents I actually end up buying in my holiday shopping spread. I talked a bitit in a previous guest post about why I stopped trying to make my bullet journal pretty, and although I did use my beloved Crayola Supertips to add a bit of holiday hue to this spread, that’s still pretty much true here. My bullet journal is about function over flair, especially during the holiday season when a thousand and one to-dos are competing for space in my mind Inside Out-style. So without further ado, let’s take a quick look at the way I set up my holiday spread. It’s a simple spreadsheet layout, and each row pertains to one person I need to buy gift(s) for; the first column is a list of their names. The next column is my fave because it’s where I get to jot down ideas of what I might want to get each person. This is done on an ongoing basis, whenever I think of something, and I love this part because it means I get to start my holiday spread in October 😉 Preparation is the best excuse for jumping the gun on Christmas*, right? The next column to the right is one that won’t get touched much until later in the holiday season. Once I’ve decided what I’m actually going to purchase (or make) for each person, I write it down here. You could also add a “money spent” column for an easy way to keep track of your holiday expenditures. Up top, I’ve also got a small section labeled “On Hand”. Now, I’m not endorsing re-gifting, but sometimes a thrifty student’s gotta do what she’s gotta do…this is where I track gifts or items (often gift cards) that I have on hand (whether someone’s given them to me or not) that could potentially be given as gifts this year. That pretty much sums up my neat little method for holiday spending tracking…at least for this year! How do you plan for the holiday season in your bullet journal? *Note: I celebrate Christmas, but this spread would work equally well for Hanukkah, Kwanzaa, anything you celebrate! Katie is a freelance writer and future school psychologist from Vancouver, Canada. When she’s not writing, studying, or bullet journaling, she can be found running, singing a cappella, or playing with her friends in their wedding band, the I Dudes. You can check out her writer website here. Love this arrangement. I’ve done informal stuff like this on sticky notes but I’m totally putting it in my bujo this year! You really make it appear so easy with your presentation however I to find this matter to be really something which I believe I would never understand. It kind of feels too complicated and very vast for me. I’m looking forward in your next put up, I’ll attempt to get the grasp of it! It’s actually a nice and helpful piece of information. I’m happy that you shared this helpful information with us. Please stay us up to date like this. Thanks for sharing.